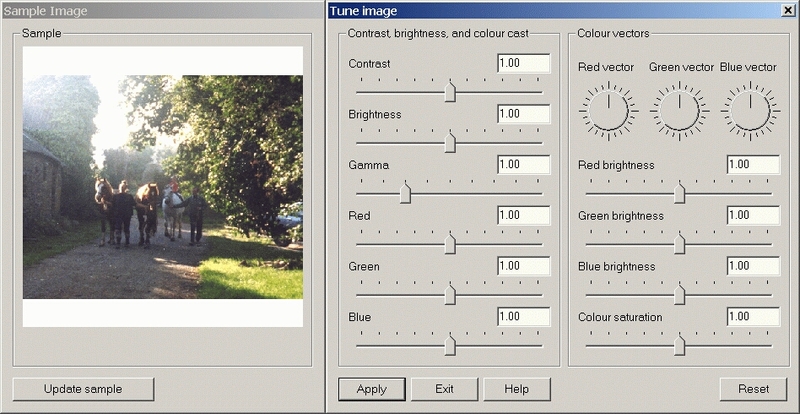 The lastest version for Windows® is in use on both Windows 7® and Windows 8®. Some of the images below are screenshots from different systems, and may show some visual differences due to the way different systems paint the screen. Maul is a modular product. 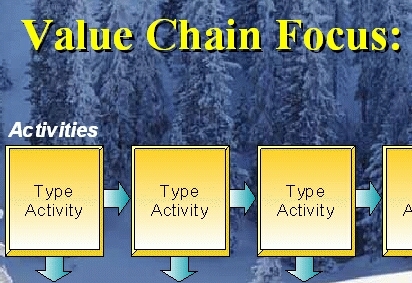 In practice what this means is that tasks are subdivided amongst handlers in such a way that frames are the responsibility of the frame handler, and text the responsibility of the text handler, and so on. This subdivision has the advantage that you are not faced with all the features and options at once. It also means that you can concentrate on the particular thing that you are doing. 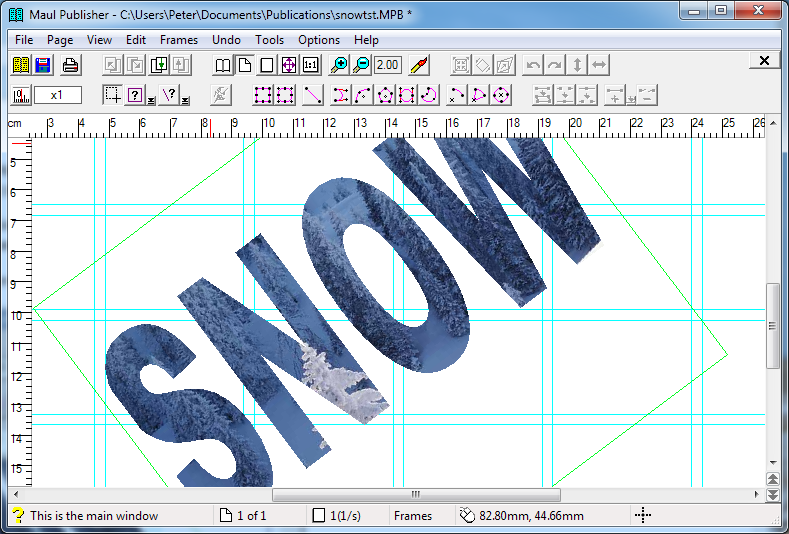 The frame handler for example provides you with all the features necessary to create frames of various shapes, group frames, copy frames, and organise the way that frames overlap. The disadvantage of the modular approach is that for some of the more complex tasks, you have to set modes for frames in the frame handler, and bitmap modes in the bitmap handler. However, it doesn't take long to get used to this, and at least forces some discipline on both the users and software developers alike. 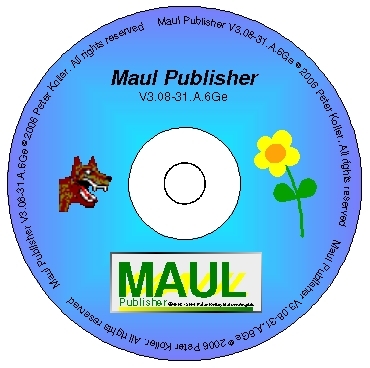 The main point of a modular system is that anyone can create a software module for Maul, and that the required headers, file formats, and manuals are available for free. Maul uses printer forms to precisely position text and images. You should make sure that you choose the form for the final output device, rather than your local printer. This ensures the greatest accuracy. If your local printer is your final output device, all the better. 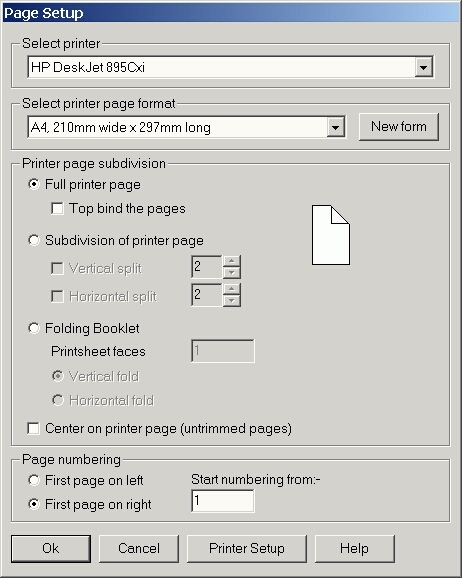 Note:- Use the printer setup to change the page orientation. Notice that three basic modes are available. These include the means to create booklets by folding a number of sheets of paper and stapling up the middle. The system will correctly number the pages for you, and will present the pages to you in the right order. The frame handler allow you to draw any shape of frame from a simple rectangle to objects containing any number of lines, splines, and arcs. 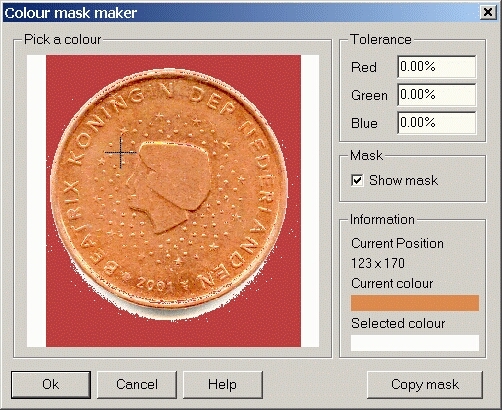 Here we choose an object layer, then add the bitmap handler to the frame and load an image. Maul contains tools to manage libraries of frames as clipart, providing you with a rapid way of creating labels, company logos, and graphical decoration. The following images show part of a page of labels, and a CD label. More sophisticated labels, such as those for CD's are readily supported, and can contain things like text around the border. In fact, you can easily create truly commercial quality CD labels. In maul, master pages are nothing more than single page publications that can be added at any time to your publication, or in any order. By using control text in master pages, you get such features as automatic page numbering or date stamping. The fact that images and text can be layered into the same frame provides an opportunity to indulge in some special effects. Here we see an image inside the text. The text handler paints the text, the bitmap handler handler paints the image, and the frame handler is where you select the mode that paints one object inside the other. This is possible because of object layers inside the frames. 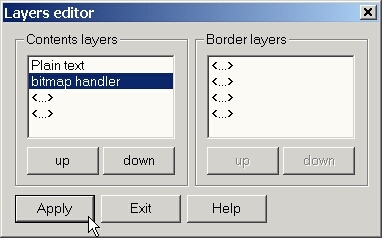 A layer editor is provided to modify the layers. The text handler is used to generate text. 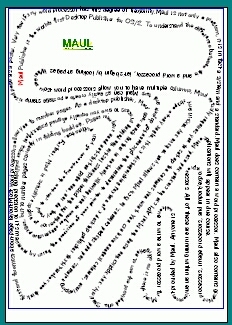 It is capable of formatting text into any shape of frame at any angle. You can insert pictures and icons into the text, where they are treated as special characters and remain as part of the text. Text can cover multiple frames as frame linkage is supported via the text handler. Maul provides advanced text features such as orphan/widow suppression, spell checking and automated hyphenation, kerning, and far more than can be shown in this document. 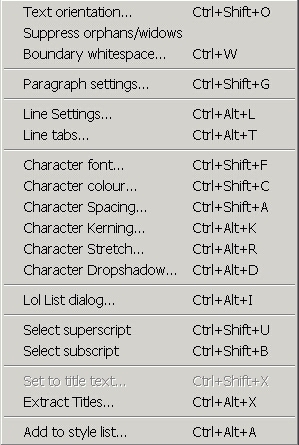 Note:- Maul has an inbuilt shortcut editor, so all the menu items shown above have customizable keyboard shortcuts. 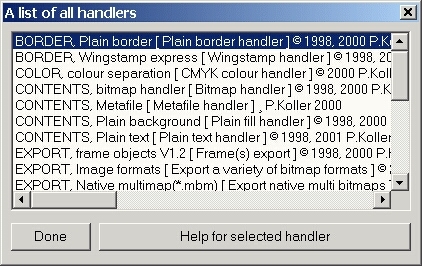 The wingstamp express handler is a variant of the text handler designed for borders, and with the kind of complex frames you can produce, you have unlimited creativity at your disposal. From version 2.25, a tables handler is included. The tables handler is used to subdivide a frame into rectangles, and can be used to present tabular data such as invoices or lists. Like everything else, entire tables can be rotated at will. 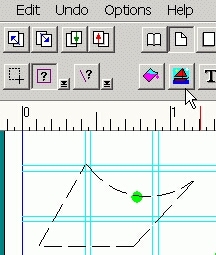 The bitmap handler provides a number of advanced features, such as supporting icon resources from both Windows and OS/2, and the ability to store large images in separate files, thus avoiding the difficulties of managing a publication with 100's of Mb of image data. You may find the very advanced image tuning features of particular interest. Here, you find all the usual controls, plus a few very unusual ones. All the 'Colour vectors' items affect the colours without affecting the underlying grayscale image. Metafiles are of particular interest for several reasons. First, you can copy frames or groups of frames in the frame handler, and paste them back into your favorite word processor as an image. This means that company logo's created in Maul can be used throughout your business, even when maul is not used to print or edit the document. The same is also true in reverse. Most spreadsheets or vector graphics applications copy data to the clipboard as a metafile. Maul will happily display, scale, rotate(*), and colour separate metafiles. The border and background handlers are used to colour fill areas of your publication. Both handlers support multiple graduated shading modes. The border handler can be used to generate arrow heads and the like. 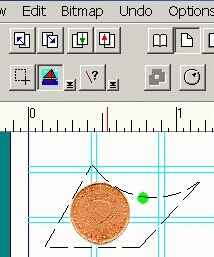 The handler supports multicoloured borders, both for closed shapes such as circles or rectangles, and for open ended figures such as lines or arcs. 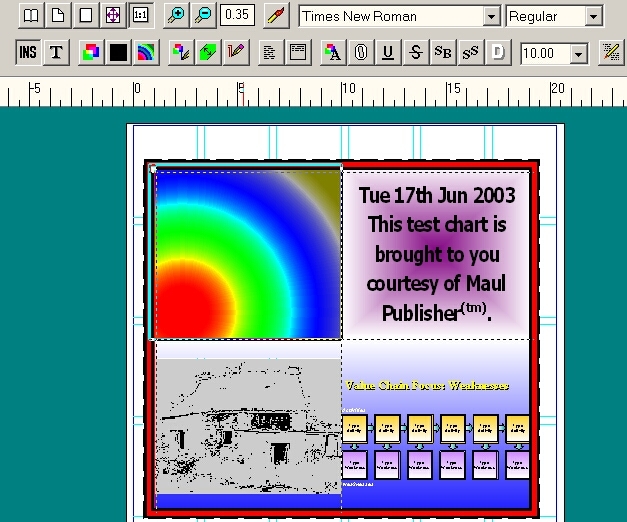 Maul can directly separate printouts into CMYK colour layers, regardless of the types of bitmaps or metafiles used. By printing postscript to a file, you can easily create all the layers necessary for offset printing. In order to be productive, it is vital to be able to consistently set the same colours thoughout a publication. Maul supports named colours in colour tables that can be loaded into the publication, saved from the publication, and merged. Colour tables are plain text files that can be edited with your favorite text editor, commented, and used throughout your publication for consistent colour management. 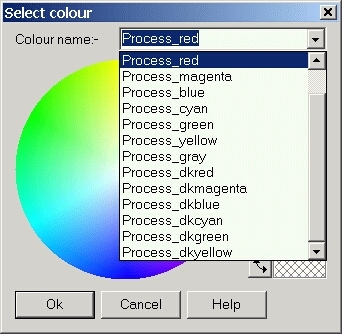 Colours can be given sensible names, and can be selected from a dropdown list. It is this attention to detail that distinguishes maul. It is squarely aimed at the problems associated with publishing, and it is for this reason that maul has a growing and enthusiastic customer base. A final note about differences between Windows and OS/2. The operating system graphics functions largely determine what features each system can provide. The differences are listed here in order to help you determine which version best meets your requirements. spellcheck Spell checking courtesy of mySpell. 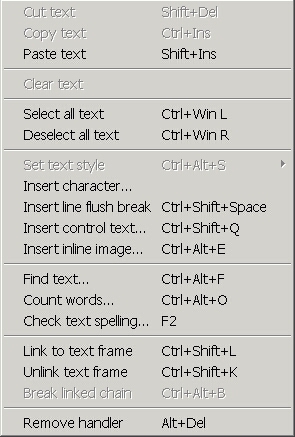 You can use dictionaries compatible with OpenOffice. as codepage and language selection No codepage selection No codepage selection Truly multilingual with full unicode support. V2.28 - uses the current system codepage. Sane2twain compatible. Twain compatible Twain compatible Twain compatible Twain support for OS/2 with the use of the Sane libraries. Character orientation Character orientation No character orientation No character orientation OS/2 directly supports character orientation. All systems support text rotation. ICM compatible ICM compatible ICM compatible ICM compatible ICM for the OS/2 version from 6th March 2007. Rotates metafiles Rotates metafiles No metafile rotation Rotates metafiles Metafiles cannot be rotated by Win98. Bitmap rotation in Win98 is performed by Maul, and is slower than the matrix functions available on other systems. Other, more subtle system differences do exist, and are often due to the differing qualities of the various screen and printer drivers.